An Afghan activist says that violence against journalists has unprecedentedly increased this year, inasmuch as the rate of violence against media professionals during the past 10 months has been equal to the one in past eight years. 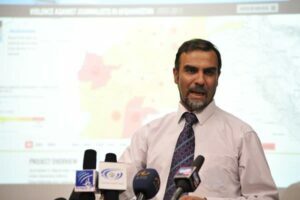 According to a report by IRNA, as translated by IFP, Sediqullah Tawhidi, the head of Nai Supporting Open Media Agency in Afghanistan, said in a press conference that this year, 377 cases of violence, including the killing of 13 journalists have been recorded in this country. He regretted that 229 journalists have been forced to leave their jobs and quit as well. “Despite all the attempts to prevent it, unfortunately the violence against journalists is still growing bigger,” he said, stressing that it is traced back to terrorist groups, government-affiliated individuals, oppressive and irresponsible armed individuals and the private sector. Tawhidi added that journalists in the provinces of Kunduz, Helmand, Farah and Urozgan have been forced to quit their jobs. “An annual average of 48 cases of violence against journalists has been recorded in the past 15 years; however, records of this year are appalling,” he said. Tawhidi called on the international community and the government of Afghanistan to take action to stop the aggression. He announced that the act of Reporter’s Privilege has been approved by the National Security Council and the President, and also a Coordination Committee has been formed between journalists, the Federation of Journalists and the government. “Despite all these, we have not witnessed any decrease in violence against the media professionals so far and this means that the situation of journalists and the media in Afghanistan has deteriorated with each day passing by,” he regretted.